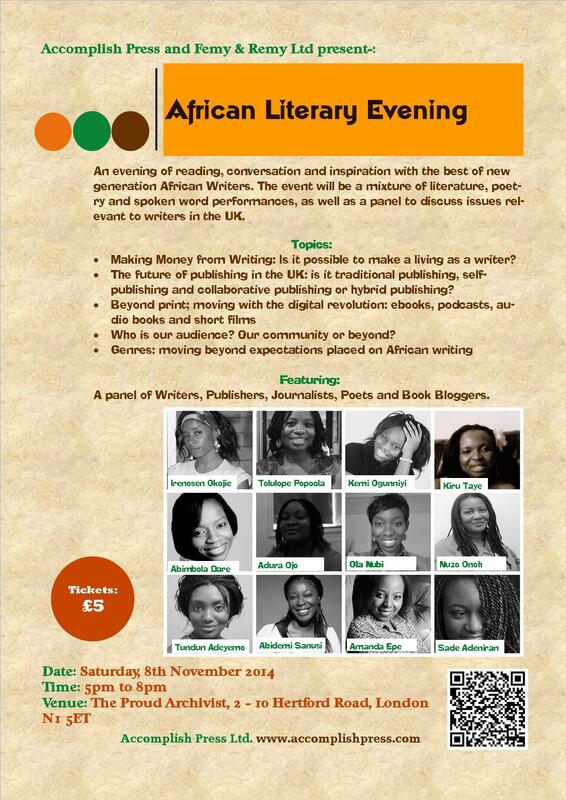 This weekend, Accomplish Press and BlackandOutspoken will host the first “African Literary Evening” in London. Everyone who is interested in writing, books, literature, poetry, drama and the Arts are welcome! This event will be a mixture of literature, poetry and spoken word performances, as well as a panel to discuss issues relevant to Nigerian/Black British writers in the UK. The panel will consist of well-known and emerging authors, publishers, journalists and poets. The evening will be hosted by BlackandOutspoken radio presenter and journalist, Tundun Adeyemo and writer, publisher and founder of Accomplish Press, Tolulope Popoola. There will be readings and spoken word performances from Ola Nubi, Amanda Epe, Tolulope Popoola, Sade Adeniran, Tundun Adeyemo and other writers. There will also be a variety of books for sale, and an opportunity to network and chat with the panel and other guests informally over snacks and drinks in the bar afterwards. The event will be filmed and video clips of the discussions and readings will be available after the day. All tickets can be purchased from Eventbrite or bought at the door on the day. We look forward to seeing you there this Saturday!